Keyless security has never looked better than Emtek's Low profile keypad handle set. Leave your keys behind with freedom and security that Emtek's keypad handle set provides. This electronic handle set fits any door between 1 3/4 inch and 2 1/4 inch thick with a 2 1/8 inch standard bore. Easy to use installation and programming instructions are provided. 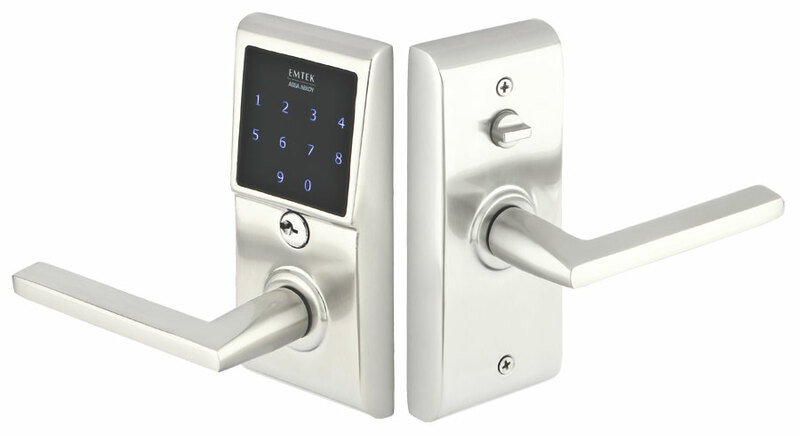 This handle set is factory programmed with 2 unique, secure user codes for use right out of the box, and can be programmed with up to 20 user codes of your choice. The codes can be added or deleted. Easy lock and unlock operation. Programming changes can be easily made using the keypad. Keypad has a protective coating to prevent wear patterns. The keypad is illuminated for quick operation after dark. This fantastic deadbolt even has a low battery indicator to let you know when it's time to change the battery. Comes standard with 2 3/8" backset; however, 2 3/4" backset is available upon request. Handing is required for leversets.